If you want to write, practice writing. Practice it for hours a day, not to come up with a story you can publish, but because you long to learn how to write well, because there is something that you alone can say. Write the story, learn from it, put it away, write another story. Think of a sink pipe filled with sticky sediment. The only way to get clean water is to force a small ocean through the tap. Most of us are full up with bad stories, boring stories, self-indulgent stories, searing works of unendurable melodrama. We must get all of them out of our system in order to find the good stories that may or may not exist in the freshwater underneath. Don't be fooled, as I was, by the title. This isn't an annoying book about the beauty of marriage, or an ironic title for a depressing book about the sad state of love and coupling. 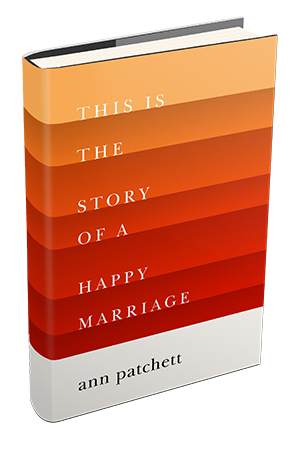 Instead it's a collection of essays by novelist Ann Patchett. Who knew that long before penning the best-selling Bel Canto, Patchett wrote nonfiction for the New York Times, Vogue, Outside, and other mags? Not me! She's got heart, wit, pace and style; she's a writer you want to befriend. I've underlined countless passages, dog-eared pages, and finally just photo-copied essays to give to friends. But really, I want to buy this book for all my writer-friends, and everyone else with a heart and head that hurts and yearns and still keeps trying to better live and love.